Before the second National Photography Symposium kicks off in Derby tomorrow, organiser Paul Herrmann explains why it is important to debate the issues that threaten the photographic industry today. It’s all too easy to get caught up in the day-to-day hassle of being a photographer. The National Photography Symposium is about taking a step back, finding some time to look at the bigger movements and issues that affect photography as a whole, and thinking about how we can set the agenda for the future. There are some good examples of that from last year’s Symposium: discussions of the treatment of photographers by police and security led on to the creation of I’m a Photographer, Not a Terrorist. 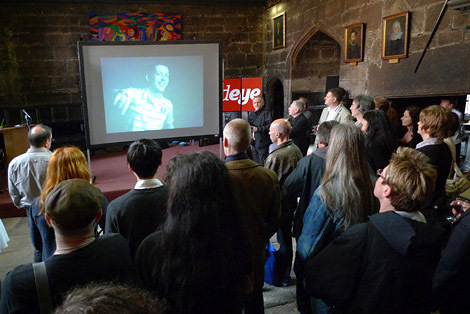 The 2009 Symposium also outlined the government’s Digital Britain report and its attitude to orphan works; photographers carried on to form Stop43, which successfully lobbied for a change to the law. NPS 2009: outlining the Digital Britain Report. Photo © Paul Herrmann. The National Photography Symposium is specifically aimed at working photographers – it’s not an academic conference, but it is intended to be intelligent, challenging and cutting edge. The main feedback request last year was for more time to discuss things. So in 2010 the sessions are longer, the presentations are shorter, and there’s more breaks. Keynote presentations this year are from Robert Pledge, president of Contact Press Images; Francis Hodgson, photography critic of the Financial Times; and the photographer and artist Rut Blees Luxemburg. There are debates and discussion sessions on several issues that affect photography and photographers: terrorism and consent, copyright and orphan works, skills and education, climate change, new media and new opportunities, photo libraries and licensed images, and museums and galleries. The election might get a mention too. And there is lots more going on including photographers’ work on show; workshops on preparing exhibitions and the latest imaging software. The event finishes with an enlightening walk. EPUK regulars, David Hoffman, Paul Ellis, Neil Turner and Andrew Wiard are speaking, and you can find more information here: National Photography Symposium. • The second National Photography Symposium is at QUAD, Derby DE1 3AS from May 7th to 9th 2010. Tickets are £60 (£45 concessions) for the full event and are available from the QUAD website.